Russian nation is the basic population of the Russian Federation (119865,9 thousand people), the most numerous of Slavic tribes. Outside the Russian Federation they live in Ukraine, Kazakhstan, Uzbekistan, Byelorussia, Kirghizia, Latvia, Moldova, Estonia, Azerbaijan, Tadjikistan, Lithuania, Turkmenistan, Georgia, Armenia, and also in USA, Canada, the countries of the Western Europe etc. The Russian Language is of east group of Slavic languages of Indo-European family of languages. Writing is on the basis of the Russian alphabet which is going back to cyrillics. Religion is basically orthodox. The history of the Russians is very much a history of territorial and ethnic expansion. In the pre-Christian era, the region that is today called Russia, was inhabited by a variety of nomadic tribes. The Slavic tribes resided in the north. In the 6th c., they started migrating. Gradually they evolved into three basic groups, from which with time different with sub-groups would evolve; the western Slavs (Poles, Slovaks, Czechs), southern Slavs (Slovenes, Croats, Serbs, Bulgars) and eastern Slavs (Belarusians, Russians, Ukrainians). The eastern Slavs expanded easily from the Baltic to the Black Sea, with Kiev and Novgorod as the most important centres. According to Russian tradition, the first Russian dynasty began as warring Slavic tribes in 862 invited Rurik, a Scandinavian leader, to rule over them. Under the Rurik dynasty, Russia expanded northeast and northwest. Kiev soon became the centre of what is known as Kievan Rus', which reached its imperial peak in the middle of the 11th c. In 988, Prince Vladimir of the Kievan Rus' had decided to convert the empire to Byzantine Orthodox Christianity instead of Roman Catholisism. This contributed to isolate Russia from the West. This isolation was furthered by the Mongol invasion which began in 1223. The Mongols controled Russia during the two centuries when the Renaissance, the Reformation and the commercial revolution spread across Western Europe. Mongol rule also made the westernmost Russians flee farther to the West to escape. These people eventually became known as Belarusians. The people of Kiev also developed a separate culture and evolved into Ukrainians. Russian, as well as Ukrainians and Byelorussians, came from the ancient Russian nationality (9-13 centuries), existent from East Slavic tribes during the period of disintegration of tribe relations and creation of the ancient Russian state around Kiev. 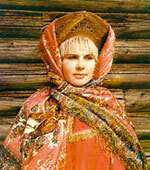 In opinion of many researchers, the name 'Russian' goes back to the name of one of Slavic tribe - Rodii, Rossy, or Rusy. Alongside with the ancient self-name in 19 - beginning of 20 centuries the name Velikorusy or Velikorossy was used. Formation of Russian, or Great Russian, nationality took place in severe struggle against the hardest Tatar yoke and during the creation of the Russian centralized state around Moscow in 14-15 centuries. In 16-17 centuries borders of Russian state considerably extended; at this time Russians began to occupy the Lower Volga region, Ural, Northern Caucasus and Siberia. In 18-19 centuries the further expansion of borders of the state was accompanied by moving Russian into the Baltic, Black Sea region, Transcaucasia, Central Asia, Kazakhstan, Far East. Russians came into close contact with peoples living here, influenced them economically and culturally and perceived achievements of their culture and skills of economy. The Russian empire had now strecthed beyond the original "Russian" areas and included many other nationalities. This triggered a series of Russification campaigns under Nicholas I and his successor Alexander II with the slogan "Autocracy, Orthodoxy and Nationality". In 1839 the Uniate church of Ukraine and Belarusia was suppressed, and in the 1860s, the state ordered that all teaching in public schools be conducted in Russian and prohibited non-Russian newspapers and magazines. In the second half of the century, Russian expansion in Caucasus and Central Asia began again. By the mid-1860s, the Caucasians were defeated, and 20 years later the Russians also controled Central Asia. In the Far East, the city of Vladivostok was established in 1860 on the coast near the Korean border, after Russia gained the territory between the Amur river and the Korean border through the Treaty of Beijing the same year. The cost of these operations led the tsar to sell Alaska to the USA for a ridiculously low amount of money. With World War I and the Bolshevik revolution, Russia lost control of Poland, Estonia, Latvia, Lithuania, Finland, Ukraine, and parts of the Caucasus, as established in the 1918 Treaty of Brest-Litovsk. As the Bolsheviks gained the upper hand in 1919, they by force established Soviet republics in Belarus, Ukraine (both in 1919), Azerbaijan, Armenia (1920) and Georgia (1921). With World War II, the Soviet Union regained most of the lost territories and pushed its sphere of influence further west than ever before. In the beginning of 20 century on fragments of Russian Empire, the new state Soviet Union, united set of various nationalities, was created. The most numerous nation, however, remained Russians. In 1991 the USSR ceased its existence. By virtue of specific conditions of development in different areas of the country, in the middle of 19 century there was a number of ethnographic groups among Russians. Largest of them, differing in dialects of language and features in buildings, clothes, some ceremonies etc., - northern and southern Velikorussy. A link between them - middle great Russian group occupying the central area - part of the Volga-Oka rivers land (including Moscow) and the Volga region; it had in its language and culture both north and south great Russian features. Smaller ethnographic groups of Russians - Pomors (on the coast of the White sea), Meshera (in the northern part of Ryazanskaya oblast), various groups of Cossacks and their descendants (on the rivers of Don, Kuban, Ural, Terek, and also in Siberia); old believe groups - "Polyaks" (in Altai), Semeyskiye (in Transbaikalia), "Kamenshiki" (on the river Buhtarma in Kazakhstan); Russians make up special groups in Far North (on the rivers Anadyrs, Indigirka, Kolyma), apprehending many features of environmental peoples. Now these ethnographic groups in many respects have lost the unique features, because of a number of historic and political reasons.